Ten persons are sitting in two parallel rows with equidistance from each other. In the row-1, P, Q, R, S and T are sitting and all of them are facing north, also they all are scored different marks in multiples of 9. In the row-2, A, B, C, D and E are sitting and all of them are facing south, also they are scored different marks in multiples of 7. The persons are seated left to right as the marks scored in ascending order in each row and none of them scored more than 80 marks and less than 15 marks. E sits second to the left of the one who faces the person who scored the marks in multiple of 5. Two persons are sitting between T and the one who faces the person who scored the marks in multiples of 8. T does not scored the maximum marks among the persons sitting in the same row.B sits second to the right of the one who scored the marks in multiple of 6, who scored 7 marks more than C scored. R sits second to the left of the person who scored the marks in multiples of 7, who does score the highest marks in the same row. T does not scored the marks in multiples of 6. D faces the person who scored 22 marks less than himself. E does not scored the marks in even number. S does not scored the lowest mark. As many persons sitting between B and E is same as between S and P.
1. 1)Which of the following pairs represents the persons who scored highest marks in each rows? E sits second to the left of the one who faces the person who scored the marks in multiple of 5. Two persons are sitting between T and the one who faces the person who scored the marks in multiples of 8. T does not scored the maximum marks among the persons sitting in the same row. B sits second to the right of the one who scored the marks in multiple of 6, who scored 7 marks more than C scored. From the above statement, the only possible mark in multiples of 6 is 42 and definitely C scored 35 marks. R sits second to the left of the person who scored the marks in multiples of 7, who does score the highest marks in the same row. T does not scored the marks in multiples of 6. 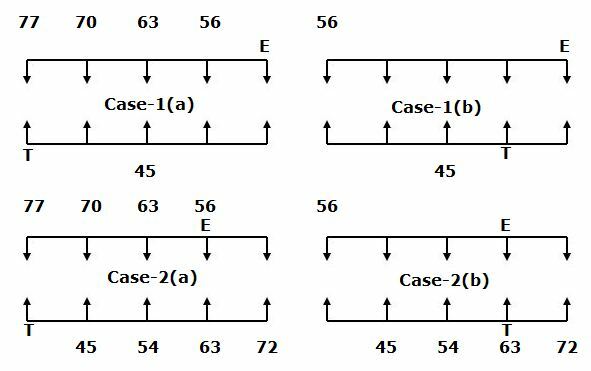 Here in the Case-2(b), based on the marks only one person must be sitting between E and the one who scored 56 marks. 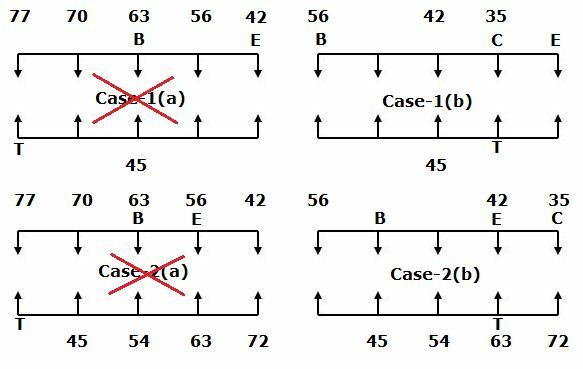 So, Case-2(b) will be dropped. D faces the person who scored 22 marks less than himself. E does not scored the marks in even number. S does not scored the lowest mark. 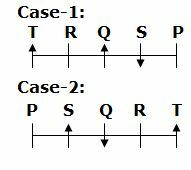 As many persons sitting between B and E is same as between S and P.
2. How many persons sitting between T and the one who faces B? 3. What is the sum of the marks scored by R and C? 5. If R is related to 42 and E is related to 63 in a certain way. Then Q is related to which of the following? Five persons P, Q, R, S and T are sitting in a straight line facing both north and south directions. Does Q sits exactly between S and R? I. P sits at one of the extreme ends of the line. Only two persons are sitting between P and R. T sits to the immediate left of R. Q and S are immediate neighbours of each other. II. T faces north and sits at one of the extreme ends of the line. Only two persons are sitting between T and S. R sits second to the right of S. R sits to the immediate left of Q. How far is point C from point A? I. A person starts from point A, walks 12m to the south, take a right turn and walks for 2m. He then takes a left turn and walks for 5m. He takes a left turn again, walks for 2m and reaches point B. If the person takes a left turn and walks for 5m, he will reach point C.
II. A person starts from point A, walks for 12m towards east, then took a left turn and walks for 4m. He then took a left turn again and walks for 12m to reach point X. If he took a right turn from point X and walks for 6m, he will be in 29m away from point C.
Is S is mother of M? II. 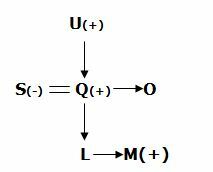 U has only two children O and Q. Q is father of L. M is the only brother of L. O is unmarried person. U is father-in-law of S.
Five persons H, I, J, K and L are sitting around a circular table. Does K faces the centre of the table? II. I sits to the immediate right of J. H sits to the immediate left of L. L is not an immediate neighbour of I. L faces the centre. K is not an immediate neighbour of J. 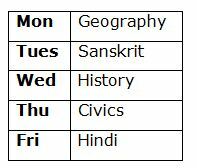 In a school five subjects History, Civics, Geography, Hindi and Sanskrit are taught on five different days of the same week starting from Monday and ending on Friday. Is Civics is taught on Wednesday? I. Two subjects are taught between Hindi and Sanskrit. Sanskrit is taught before Hindi. Civics is taught on the day immediately after the day when History is taught. Geography is not taught on Friday. Hindi is not taught on Wednesday. II. Three lectures are scheduled between the lectures of Geography and Hindi. Sanskrit is taught immediately before History. So, Civics is not taught on Wednesday. E sits second to the left of the one who faces the person who scored the marks in multiple of 5. Two persons are sitting between T and the one who faces the person who scored the marks in multiples of 8. T does not scored the maximum marks among the persons sitting in the same row.B sits second to the right of the one who scored the marks in multiple of 6, who scored 7 marks more than C scored. R sits second to the left of the person who scored the marks in multiples of 7, who does score the highest marks in the same row. T does not scoredthe marks in multiples of 6. D faces the person who scored 22 marks less than himself. E does not scored the marks in even number. S does not scored the lowest mark. 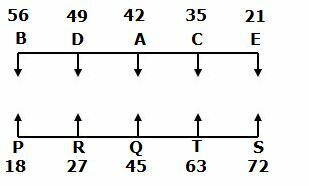 As many persons sitting between B and E is same as between S and P.
1) Which of the following pairs represents the persons who scored highest marks in each rows? 2) How many persons sitting between T and the one who faces B? 3) What is the sum of the marks scored by R and C? 5) If R is related to 42 and E is related to 63 in a certain way. Then Q is related to which of the following? 6) Five persons P, Q, R, S and T are sitting in a straight line facing both north and south directions. Does Q sits exactly between S and R? 7) How far is point C from point A? 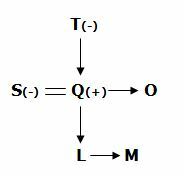 8) Is S is mother of M? 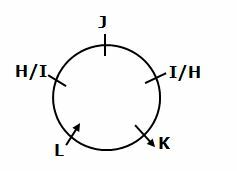 9) Five persons H, I, J, K and L are sitting around a circular table. Does K faces the centre of the table? 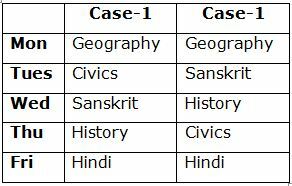 10) In a school five subjects History, Civics, Geography, Hindi and Sanskrit are taught on five different days of the same week starting from Monday and ending on Friday. Is Civics is taught on Wednesday?